This example uses a SAS data set named Growth, which contains economic growth rates for countries during two time periods: 1965–1975 and 1975–1985. The data come from a study by Barro and Lee (1994) and have also been analyzed by Koenker and Machado (1999). There are 161 observations and 15 variables in the data set. The variables, which are listed in the following table, include the national growth rates (GDP) for the two periods, 13 covariates, and a name variable (Country) for identifying the countries in one of the two periods. The goal is to study the effect of the covariates on GDP. The following statements request median regression for a preliminary exploration. They produce the results that are in Output 95.2.1 through Output 95.2.6. The QUANTREG procedure uses the default simplex algorithm to estimate the parameters and uses the MCMB resampling method to compute confidence limits. Output 95.2.1 displays model information and summary statistics for the variables in the model. Six summary statistics are computed, including the median and the median absolute deviation (MAD), which are robust measures of univariate location and scale, respectively. 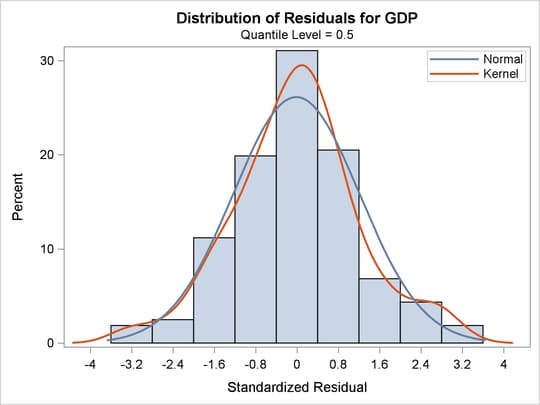 For the variable lintr2 (human capital), both the mean and standard deviation are much larger than the corresponding robust measures (median and MAD), indicating that this variable might have outliers. 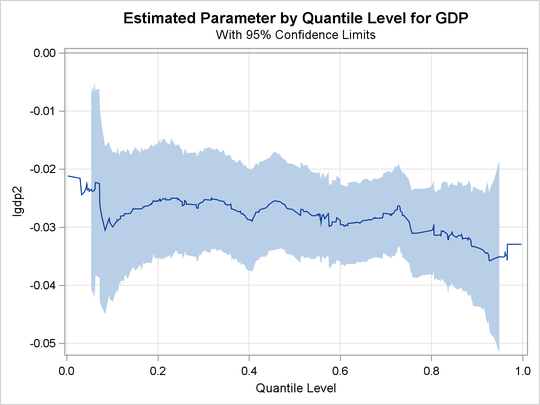 Output 95.2.2 displays the parameter estimates and 95% confidence limits that are computed with the rank method. Diagnostics for the median regression fit, which are requested in the PLOTS= option, are displayed in Output 95.2.3 and Output 95.2.4. 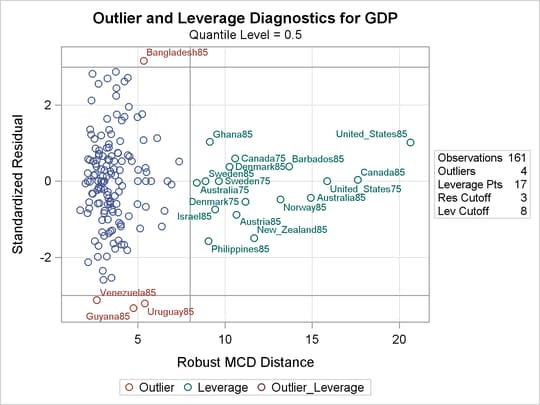 Output 95.2.3 plots the standardized residuals from median regression against the robust MCD distance. This display is used to diagnose both vertical outliers and horizontal leverage points. Output 95.2.4 plots the robust MCD distance against the Mahalanobis distance. This display is used to diagnose leverage points. 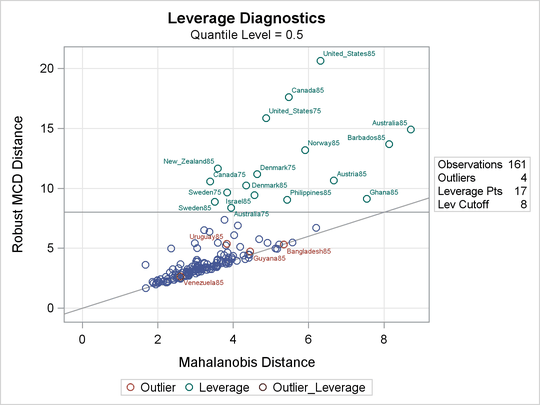 The cutoff value 8, which is specified in the LEVERAGE option, is close to the maximum of the Mahalanobis distance. Eighteen points are diagnosed as high leverage points, and almost all are countries with high human capital, which is the major contributor to the high leverage as observed from the summary statistics. Four points are diagnosed as outliers by using the default cutoff value of 3. However, these are not extreme outliers. A histogram of the standardized residuals and two fitted density curves are displayed in Output 95.2.5. This output shows that median regression fits the data well. Tests of significance for the initial per-capita GDP (LGDP2) are shown in Output 95.2.6. 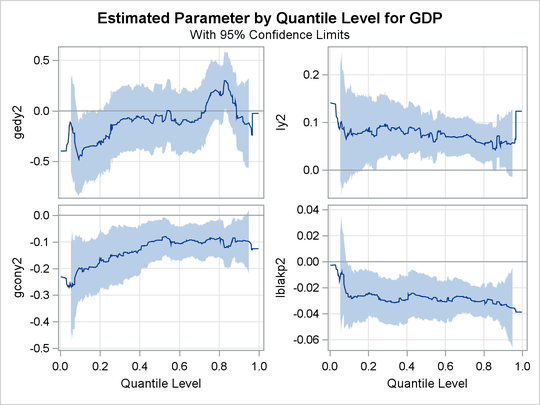 Confidence limits for quantile processes can be computed by using the sparsity or resampling methods. But they cannot be computed by using the rank method, because the computation would be prohibitively expensive. A total of 14 quantile process plots are produced. Output 95.2.7 and Output 95.2.8 display two panels of eight selected process plots. The 95% confidence bands are shaded. The plot is shown in Output 95.2.9. The confidence bands here are computed by using the MCMB resampling method. In contrast, Koenker and Machado (1999) used the rank method to compute confidence limits for a few selected points. 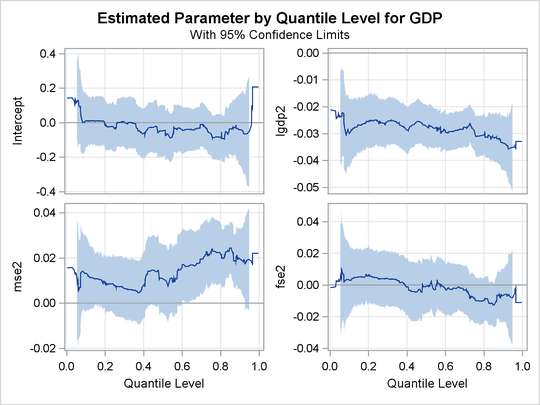 Output 95.2.9 suggests that the effect of the initial level of GDP is relatively constant over the entire distribution, with a slightly stronger effect in the upper tail. The effects of other covariates are quite varied. An interesting covariate is public consumption divided by GDP (gcony2) (first plot in second panel), which has a constant effect over the upper half of the distribution and a larger effect in the lower tail. For an analysis of the effects of the other covariates, see Koenker and Machado (1999).